Orihuela is geographically the largest municipality in the province of Alicante, covering an area of 365 square kilometres, and is also the capital of the Vega Baja Comarca of the Alicante province within the Valencia region. It is the fourth largest municipality in terms of population with over 90,000 inhabitants, of which as many as 38,000 are non-Spaniards. So what brings them here? The reasons for the recent explosion of residential tourism are a combination of all of the factors which tend to attract expats: the weather, the beautiful beaches, the gastronomy, the golf courses, the lifestyle and a host of other factors. The coastal area was already built up to a certain extent in the 1970s and 80s due to the expansion of Spanish residential tourism, creating tree-lined residential areas, well looked-after beaches and established golf courses: Club de Golf Las Ramblas de Orihuela, Las Colinas Golf and Country Club, Campoe Golf Villamartin and Real club de Golf Campoamor. Nowadays the residential areas have spread inland, and the golf courses are lined with residential properties, but in the midst of all this development good sense has prevailed and building is, for the most part, low-rise. In total there are 57 different urbanisations, which are loosely grouped into: Dehesa de Campoamor, Cabo Roig, Playa Flamenca, La Zenia, La Regia, Las Mimosas, Los Dolses, Mil Palmeras and Villamartin. Inevitably the coast and the City of Orihuela are two very different worlds. Orihuela Costa has 18 kilometres of coastline,with sporting marinas at Cabo Roig and Dehesa de Campoamor, as well as an excellent offering of beaches, Playas Capitán, Caleta, Aguamarina, la Glea, Barranco Rubio, Cala Estaca, Cala Mosca, Mil Palmeras and Flamenca all offering a range of bathing conditions, but all with excellent access, facilities and activities for holidaymakers, all serviced by an ample offering of hostelry, commercial centres and service sector businesses. Inland is a totally different landscape, agriculture the primary activity, the land rising on the Sierra de Orihuela, the city itself surrounded by the imposing Sierra de Hurchillo, with the River Segura running at its feet. Even further inland the El Agudo-Cuerda de la Murada offers a higher and drier landscape, split with ramblas, barrancas and pine scrubland, while in the centre is the embalse de la pedrera, creating another unique set of landscapes and leisure facilities. The city of Orihuela itself is a fascinating historic location, the modest story of its development over the last two hundred years masking a period of splendour in the late Middle Ages and Early Modern period, when imposing churches, convents and palaces were built. These dominate the urban structure of the city today, the city crowned by the remains of the Arab castle, the Castillo de Orihuela, and beneath its modern streets the Museo de la Muralla still holds the remains of the former Moorish city and the wall that surrounded it. The 13th century Gothic Cathedral, the Santa Iglesia Catedral del Salvador stands in the heart of the city, the Convento de Santo Domingo the largest monument in the Valencia region.The Iglesia parroquial de santas Justa and Rufina has a rare Gothic tower, the Santuario de Nuestra Señora de Monserrate an important collection of paintings, the Iglesia parroquial de Santiago Apostól an impressive carved façade, the Monasterio de San Sebastian a reproduction of the shroud of Turin, and there are many other convents and religious buildings, some of which sell sweets and pastries directly to the public. The locals are fiercely proud of their heritage, as can be witnessed during the fiestas. 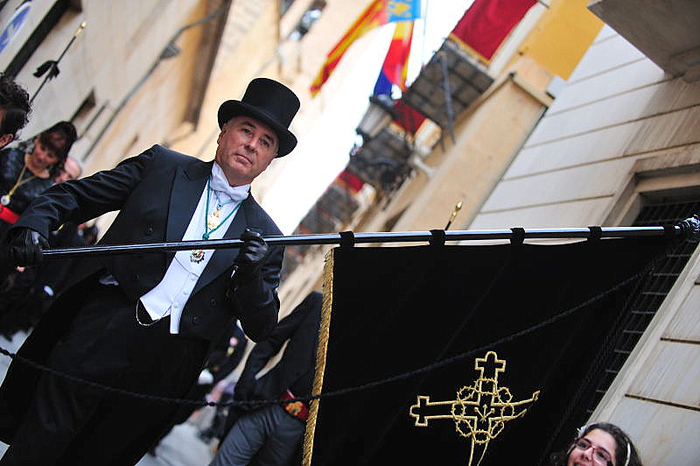 The Day of the Reconquista on 17th July stands out among these, celebrating the events in 1243 which led to Orihuela being liberated from Moorish rule, and there is also a museum dedicated to these Moors and Christians celebrations, which are also at the heart of the winter Mediaeval market, held at the end of January, one of the largest in Valencia. 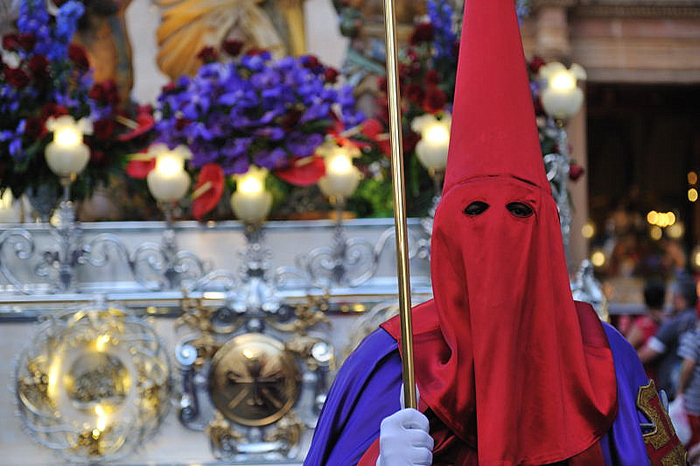 The Easter Week celebrations are another spectacular demonstration of the Oriolanos’ sense of identity, and there is a museum dedicated to Semana Santa, a rare 17th century sculpture by Nicolas de Bussy in the archaeological museum which still participates in the parades and the town also has the unique tradition of the Caballero Cubierto, who can be seen in the form of a statue outside the Cathedral . Another source of great pride is the Orihuela poet Miguel Hernández, who died in prison aged only 31 in 1942 after fighting on the losing side in the Civil War. The city is now full of reminders of the man and his work, and apart from his childhood home, which is now a museum, visitors should also pay a visit to the murals of San Isidro which were painted in his honour during the transition from dictatorship to democracy. 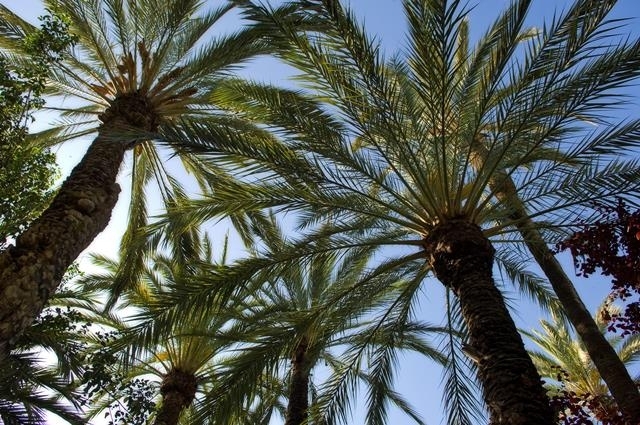 Another reminder of the historic past of Orihuela is the palmeral, the palm grove which has survived more than a thousand years, virtually intact from the days of Moorish occupation. These links to the Arab past of the area are still echoed in the gastronomy of the area, the fruit and vegetables, the olive oil, the local meats and of course the products of the sea all combine to ensure succulent and healthy eating at every turn. 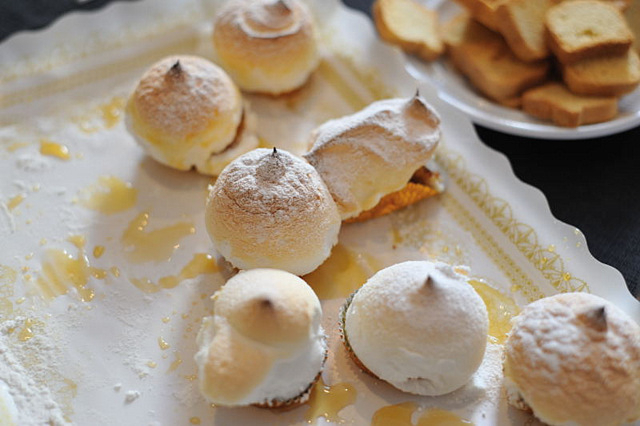 Among local specialities are arroz con costra, all kinds of paella and a variety of sweet dishes which can be sampled in the restaurants and tapas bars of the municipality. The municipality is further subdivided into a number of pedanías, or administrative districts, linked to the city by bus routes, and a train station: Arneva, Barbarroja, Camino de Beniel, Camino Viejo de Callosa, Correntías Altas, Correntías Medias, Correntías Bajas, El Escorratel, El Mudamiento, Hurchillo, La Aparecida, La Campaneta, La Murada, Las Norias, Desamparados, Los Huertos, Media Legua, Molino de la Ciudad, Molins, La Matanza, Raiguero de Bonanza, San Bartolomé, Torremendo. The airport of Alicante-Elche is just a short drive away and the San Javier airport is also close by just across the border in the Murcia Region. 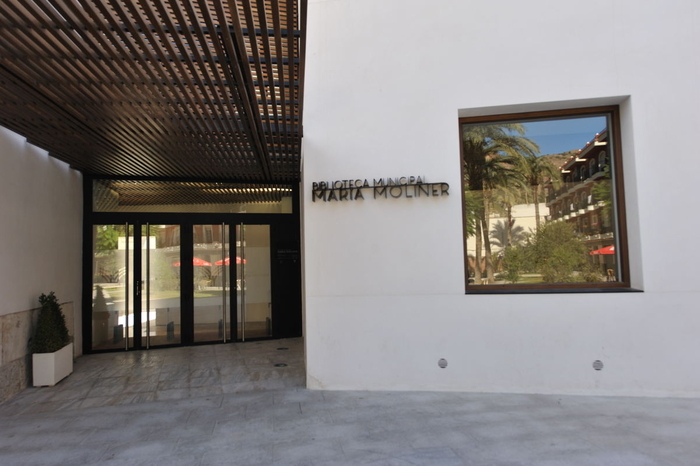 Orihuela is also a University city, the University ( Universidad de Orihuela) having two main campus: Campus de las Salesas and Campus de Desamparados. All of this is supported by an extensive network of health facilities, commercial centres and sound infrastructure, all governed from the City of Orihuela itself. A Moorish morning out in Orihuela.. 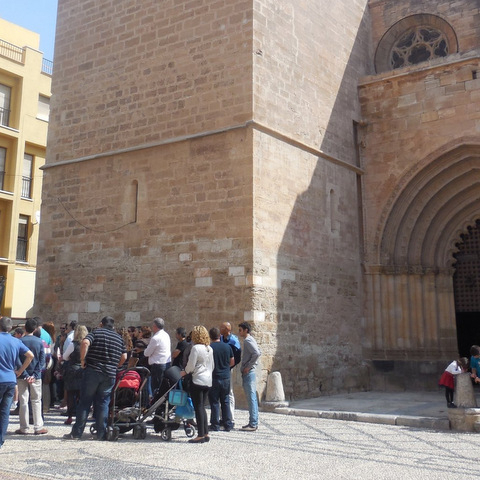 Suggested routes in Orihuela: Route 1, following the Moors Every area is defined by those who inhabited it, and although..
Coach parties welcome to decide their own itinerary in the historic city of Orihuela Every year over 10,000 people take..
Pasos, pride, passion and penitence.. The scent of incense, crackle of sweet wrappers and glow of lamplight accompanied the Good Friday procession in Orihuela..
Biblioteca Municipal, andlsquo;Marandiacute;a Molinerandrsquo; Orihuela This is the new municipal library, finally inaugurated.. The Diablesa and Caballero Cubierto.. These two unique traditions make Saturday night really special in the Orihuela Semana Santa On the Saturday evening..
Pasos, pride, passion and penitence in Orihuela for Semana Santa.. 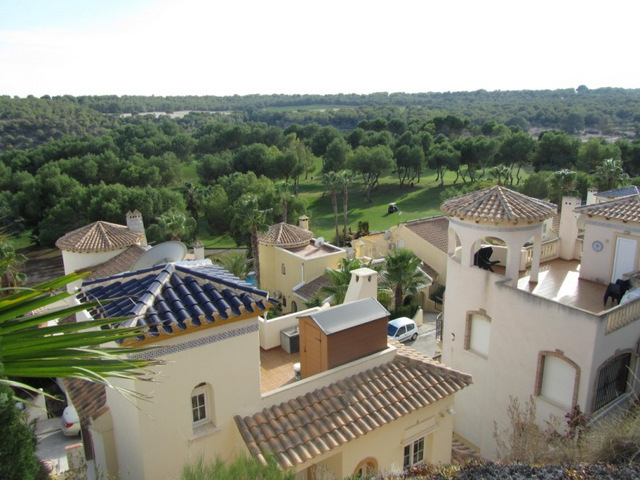 Residential area Las Ramblas Golf..
A mixture of detached villas and apartment blocksandnbsp; look out across the course All of the properties on the Las Ramblas..